Increasing the vertical leap can benefit athletes by adding inches to their jumping ability. You can increase the ability to jump higher by building and strengthening the muscles in your legs and muscle fibers as well. 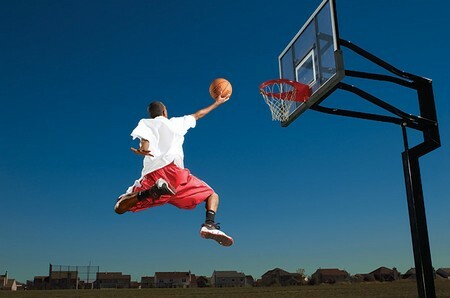 Basketball players, Volleyball players and High Jumpers all rely on these muscles to excel in their respective sports. Here is how you can increase your vertical jump. Do a warm up. This is very important. Warming up the muscles will prevent injuries and lower risk. Do leg stretches to warm up for this regimen. Jump rope to build endurance and cardiovascular conditioning. Sprint. Start sprinting to build the muscles your body will use in vetical jumping. Run up a flight of stairs on the tips of your toes. Escalate the flight of stairs one step at a time. Walk down the flight of stairs. Take two steps at a time on your decline. Repeat as many times as you can. After starting to exercise be sure to rest your body two days out of the week. You will see results after being consistent with exercise and proper rest. Use a platform or bench for this step. Place the platform or bench on a flat surface. Stand flat footed on the platform or bench. Jump off the platform or bench backward. Land as softly as you can. Do this exercise for 10 repetitions. Use a spotter for help. Also be mindful that you keep your needs bent and flexible at all times. Use your platform for this explosive leg jump exercise. Place your right foot on the platform and face the platform. Starting with the right leg, jump a high as you can. Kick your legs out in a scissor motion. Land on your left foot. You left foot should be on the platform and your right foot should be on the floor. Repeat this jump again. Do 10 sets of this explosive leg exercise. Rest for 1-1.5 minutes between your sets. To do a double jump, you will need to jump as high as you can with both feet from a flat position. Jump again with no pauses in between. Do 10 sets for this exercise.